Welcome to Down to Earth from the Naked Scientists. The mini series that explores spinoffs from space technology that are being used on Earth. I’m Dr. Stuart Higgins. This episode: how developing instruments to search for life on Mars has led to a miniature pump that can be used in a handheld explosives detector. 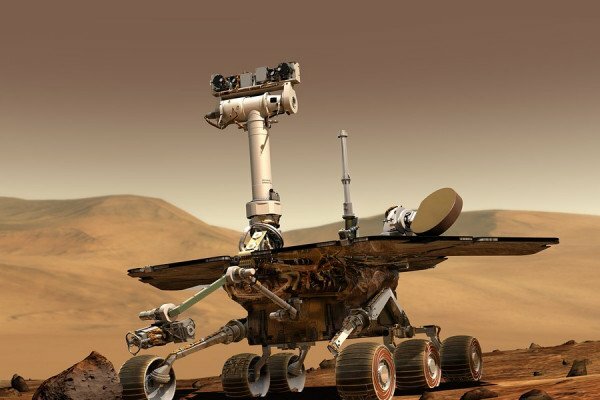 Millions of kilometres away, currently driving around the surface of Mars is the Curiosity rover. Launched in 2011 and landing less than a year later on the red planet, Curiosity is looking for signs that life could have existed on Mars. One of those signs is the presence of organic compounds; carbon based molecules that could have been formed by biological processes. To determine whether those materials are present, the Curiosity rover is carrying its own miniature mass spectrometer. A mass spectrometer is a machine that can determine the relative amount of different atoms and molecules in the material. It works by first ionising a sample: electrons are stripped from outside the atom leaving behind charged atoms known as ions. If you pass ions through a magnetic field, they experience a force which can cause them to change direction depending on their charge and mass. The larger the mass, the smaller the change in direction. In a mass spectrometer, this effect is used to deflect ions into a detector producing and electrical current. By varying the strength of the magnetic field, ions with different masses strike the detector at different times so it’s possible to build up a map of different masses in a sample. One critical requirement, however, is that the mass spectrometer operates under a vacuum to avoid the ions colliding with air molecules. That’s fine on a fine down on Earth, where we have the room and power for big pumping systems but on Mars they needed a smaller option. A US engineering firm working with NASA developed a miniature turbomolecular pump. This is a special pump which, from the outside, looks like a mini version of a jet engine you’d see on a plane. Most normal pumps work by creating a difference in pressure. However, at very low pressures, the number of gas molecules left become so small that this approach no longer works. Instead, as the jet-like blades on the pump spin round, gas molecules enter by chance and are quickly knocked by the blades down into the pump and out of the system. And the miniature version of this type of pump is now finding new life in other mass spectrometers back on Earth. If you’ve been through airport security recently you may have seen staff taking swabs from people’s bags and placing them into a machine. That machine is a mass spectrometer and it’s looking for traces of dangerous chemicals. While these machines are still relatively big and bulky, researchers and companies are working to find ways of using the miniature vacuum pump, developed for the Curiosity rover, in handheld detectors. So that’s how a miniature vacuum pump built to help find life on Mars is now being used to develop handheld detectors for explosives. Previous What's bothering birds in the South of England? Would a siphon work in space?